Just the one runner – Bronislava, at Sandown on Saturday but our staff will be kept busy with three runners at Sale and at least two at the Ipswich Cup meeting in Queensland. Taking her place in the seventh event at Sandown, the Captain Gerrard Series Final, Bronislava will relish the heavy conditions – having won over the same 1400m trip on heavy going a few weeks ago. The daughter of Galileo was having only her second run back from a spell on that occasion and strips all the fitter for Saturday’s assignment – drawn nicely in barrier six with Rhys McLeod aboard. Lightly raced filly My Dream Catcher is the first our three entries at Ipswich, emergency for the T.L Cooney 3Y0 Handicap. Should she not get a run, she will race at the Sunshine Coast on Sunday. A Cape Cross filly who displayed good potential in New Zealand, she has not had much luck at two outings since a Gold Coast victory – striking interference at Ipswich and running wide at the Sunshine Coast last time out. Calatrava, who has got back without much luck from wide gates at her last couple, has again drawn awkwardly in the Listed Ipswich Cup but a drop in class should see an improved showing from the daughter of Desert Prince. Coming off a Flemington win in a good form race, Skiddaw Peak was a little disappointing at Eagle Farm last start but a firm surface did not suit. He too has drawn out wide but a slight drop back in distance can see a much better run from the handsome chestnut. 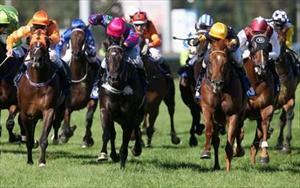 Itimio is the first of our Sale runners on Saturday and he will relish a rise in distance in the 1713m Maiden Plate. Shaping well this time in, he has been close up at both outings over shorter trips and Peter Mertens takes the ride. Whilst Itimio has drawn out, our next Sale runner Lorne Park jumps from the inside gate. He has freshened since his latest run and before that he was an impressive four length maiden winner at Pakenham. Also fresh at Sale is the promising Golden Jaguar. Out of the money in stakes company in Adelaide at his latest outing in mid April, he had been shaping very well previously and he is a horse who can shape nicely first up.